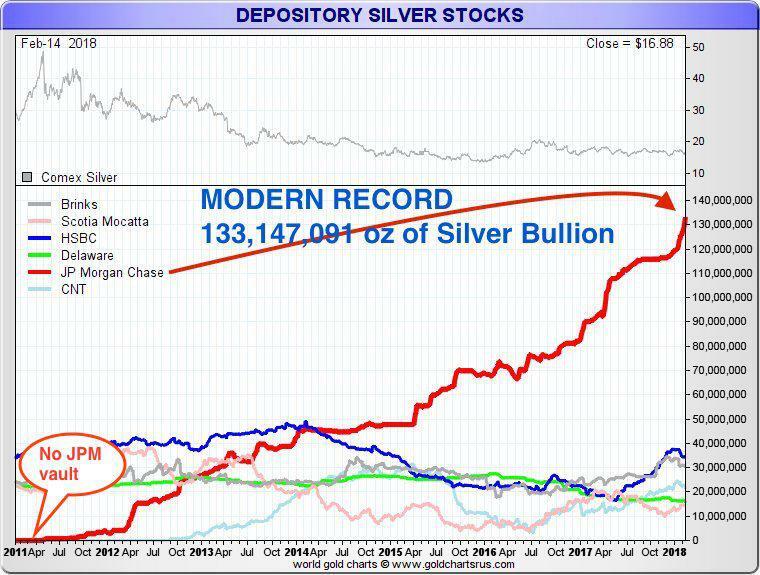 Much has been written lately about the size and scope of JPMorgan’s COMEX silver vault. We thought we’d add to that conversation today. See below for a graphical representation from GoldChartsRUs. So it’s easy to conclude that this massive hoard of silver is not customer silver in storage nor is it held in custody as a part of the SLV. Instead, this is very likely JPM’s own silver, against which JPM can issue contracts as an alleged hedge. Just as selling call options against a large equity position can yield an investor additional income, we believe JPM sells futures against this physical position. This allows them to manage price and consistently create profits for their commodity trading desk. This dominant position also allows them immunity against pesky regulations put in place to assure against monopolistic and manipulative control of the markets. The stated front and delivery month position limit in COMEX silver is 1,500 contracts. However, as you can see below, twice in 2017 the House Account of JPM was in clear violation of these limits by stopping 2,689 contracts in March and another 2,800 in December. 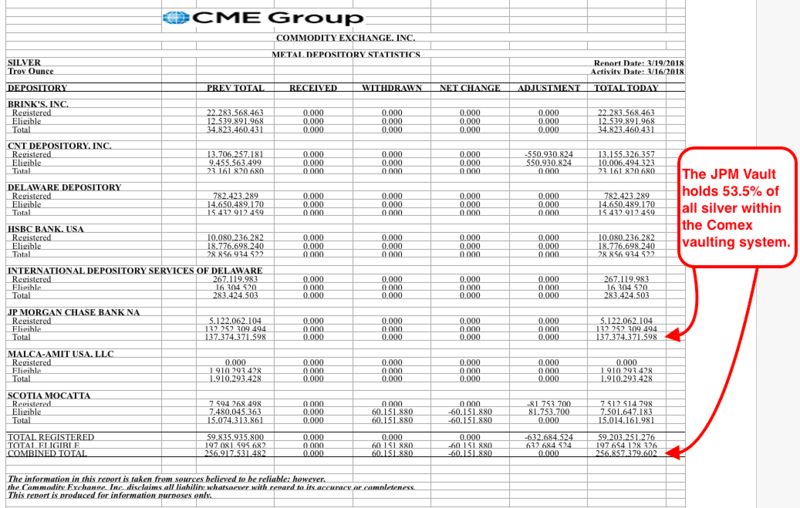 JPMorgan has amassed a monopolistic and manipulative position in COMEX silver. 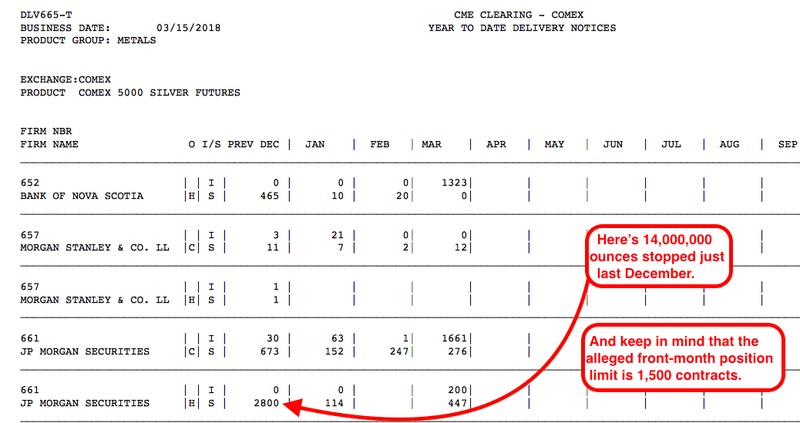 They can create and sell thousands of COMEX contracts and then justify their short position (and clear violation of mandated position limits) through their CFTC-blessed “qualified exemption”. These are your “markets” in 2018. They are dominated by Big Banks—often operating under the veil of protection offered them as Primary Dealers for the Federal Reserve. The so-called regulators have been marginalized to the point of being powerless to enforce even the simplest of statutes. Thus, price manipulation continues with no end in sight.